Burfi/barfi is a common Indian sweet. It comes in scores of different varieties and flavours, sometimes made into 2-3 tiers of different flavours and colours. This is the original, traditional way of making burfi/barfi, using khoya or mawa 1 or khoya or mawa 2 condensed milk solid. This recipe is for making plain khoya burfi, with instructions on how to make other flavours. Burfies are quite easy to make so why not give them a try! Makes 20-25 pieces. 200 gm. Khoya or Mawa 1 / Khoya or Mawa 2. 200 gm. sugar, can use less if desired. Mash or grate khoya. Cook it in a heated wok or karahi, until it becomes pinkish in colour and comes off the edges of the pan. Keep aside in a metal or heat proof bowl. Bring water to boil add sugar and stir to dissolve. Boil briskly until 3 wire consistency is obtained. Pour over the mawa, mix quickly and turn out on to the greased tray. Spread with a spatula, to approximately 2 cm. thickness. Even out with wetted fingers (to stop sticking). Sprinkle pistachio/almonds, if used, and press gently into the khoya. Put silver sheets on top gently, covering most of the surface. These come with a paper backing. 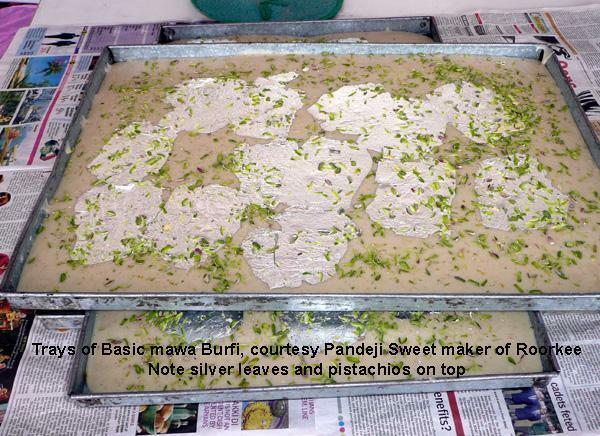 You simply place each sheet on the burfi/barfi, silver side down and peel off the paper. Cut burfies/barfies in diamond or square shapes when cool and store in an airtight box. Dissolve 3-4 tsp. cocoa powder in 1 tsp. of water or milk, before you start cooking. Keep it aside, ready. Cook as basic burfi/barfi recipe until step 3. Add chocolate to mawa/sugar syrup mix and mix well. Make burfies/barfies in a tray, following step 4-7 of basic recipe. Dissolve orange and green colours of Indian flag or other colours of choice) in a tiny amount of water each, according to the instructions on packet/bottle and keep aside separately. Follow up to step 3 of basic burfi/barfi and then divide the burfi/barfi mix in 3 portions. Add 2 colours to 2 portions and keep 3rd one colour free. You can add flavours too, if you want. Spread one colour portion on a tray to a thickness of 0.5 cm. Then add the white layer and then the third layer on top. You can choose any combination of colours and flavour. Allow to cool and cut into shapes as before. You need 100-150 gm. ground almonds (powder) for this. Cook as basic burfi/barfi until step 3. Now add ground almonds and mix well. Follow step 4-7 of basic recipe. You will need 50-70 gm. finely chopped pistachio (unsalted). Add to Khoya mix after step 3. Make burfi/barfi as in step 4-7. Dry fry approximately 500 gm. of desiccated coconuts or grated flesh of 2 coconuts. Add to fried khoya and sugar mix at step 3 of basic burfi/barfi. Allow to cool and cut into diamond or square shapes. Other varieties and flavours can be made using the same recipe. Burfies are often covered with silver varaks or leaves (very thin sheets of beaten silver which are edible and are available from good Indian stores). *silver varak used to be made by beating thin sheets of sliver between 2 layers of leather, which made it unsuitable for vegetarians. You can now get vegetarian suitable silver leaves.